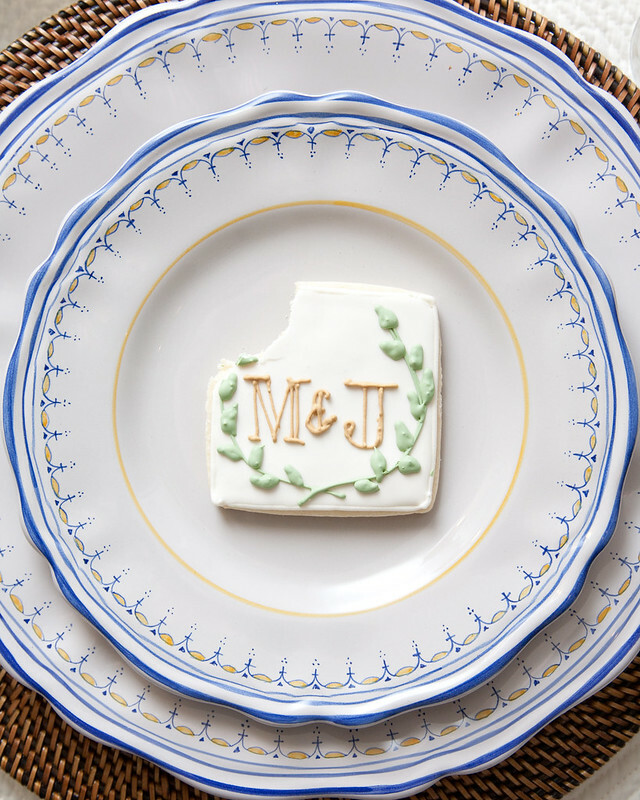 These cookies were made for a rehearsal dinner, ordered by the mother of the groom, DeDee, who just so happens to be a USF Alumni and knows Cole. 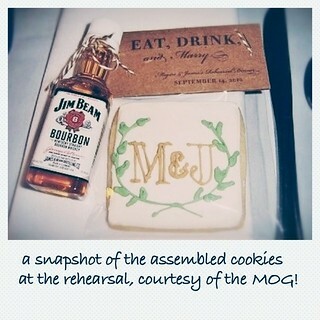 I loved that she wanted to incorporate her son's favorite drink -- Jim Beam -- into a guest favor for the Rehearsal Dinner. She got mini bottles of Jim Beam and she came to me for a cookie to go with it. What a fun pairing. I can't say I've ever put the two together, but I can't say I won't ever. 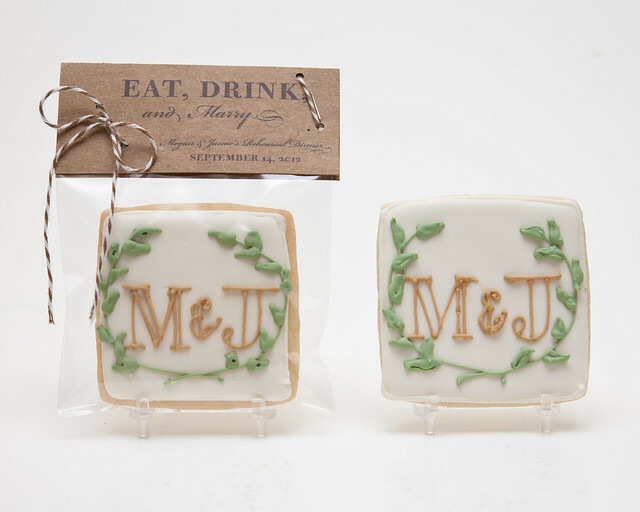 ;) DeDee wanted something wedding-y for the cookie favors, so I suggested a monogram cookie incorporating the Bride & Groom's wedding colors -- Ivory, Gold, and Sage Green. 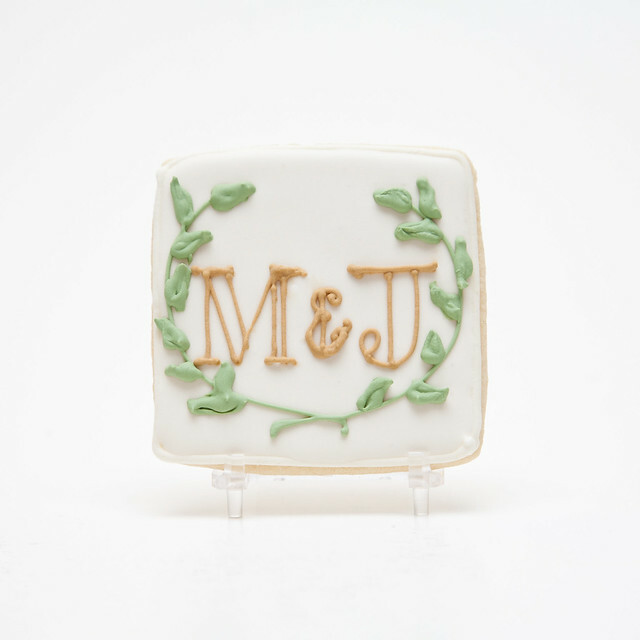 (Lavender was also in their color scheme, just not used in this cookie.) I used a little laurel wreath around the monogram, just to give it some more color & interest. Actually my mom suggested the laurel idea! 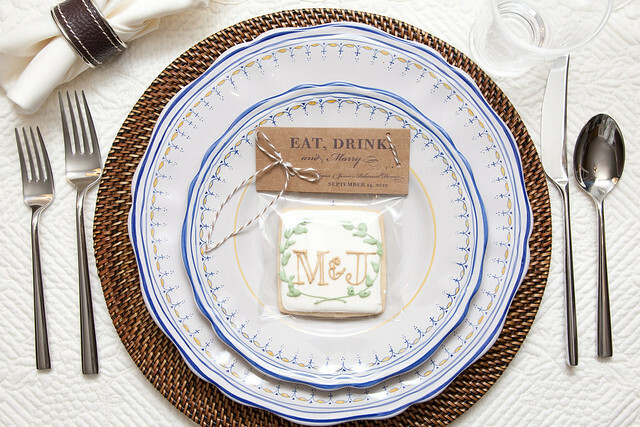 Since it's been on my radar, I've been noticing it incorporated into wedding details in some really pretty ways. For the tags, I came up with an idea to add twine to the tags so DeDee could actually attach her mini Jim Beam bottles (by tying the bow around the neck of the bottle) to the tags of the cookies for a cohesive look. 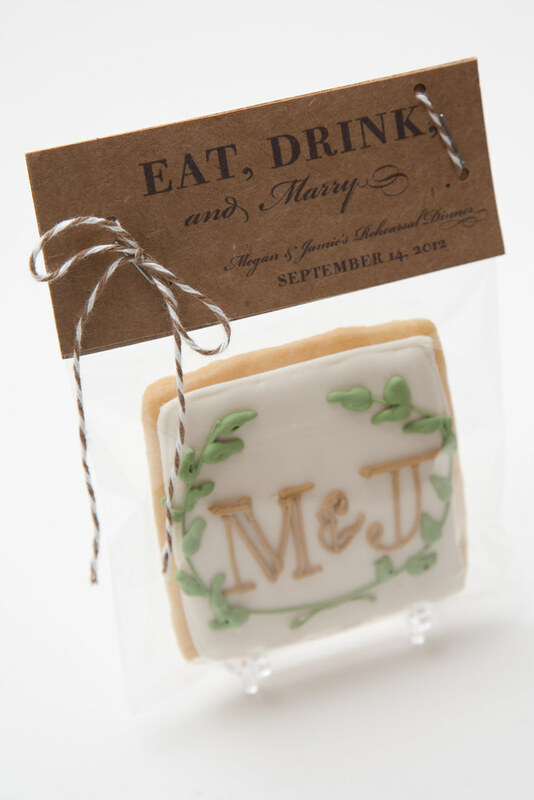 I thought these Kraft Paper tags would go well with the overall look. DeDee was all for it. I realized the photo was missing something -- since there were plans to attach a mini bottle of Jim Beam to the twine. I found a mini bottle of Jack Daniels burrowed in my extracts (with maybe a teaspoon of Whiskey left in it...) and tied the twine around it, just to get the full effect. Then, well.... I sampled it. 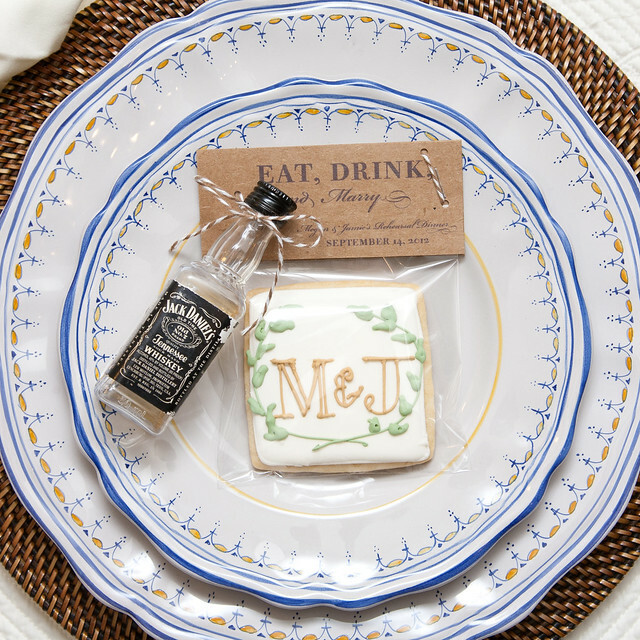 (The cookie, not the whiskey.) Just to make sure the quality was acceptable. Just part of the job, folks. Quality Control. PS- Here's a pic of the final REAL deal. Thank you DeDee for sharing the pic and thanks for the fun order! !